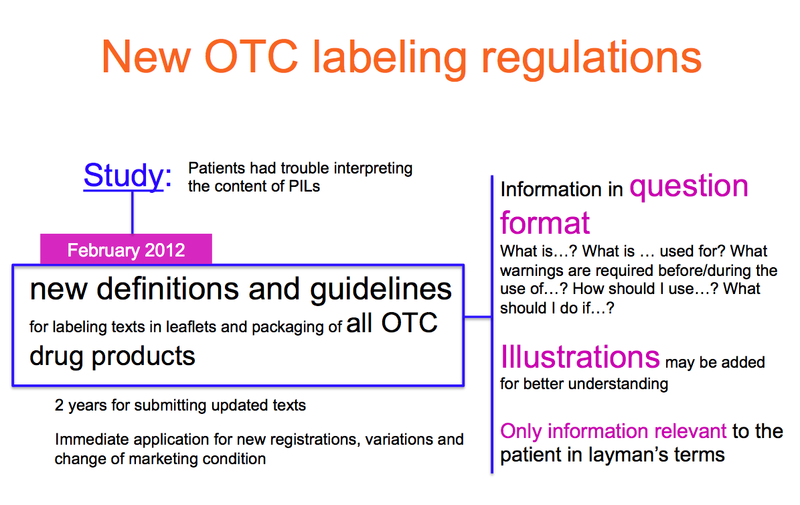 After a consumer study that revealed that patients had problems interpreting and understanding the information included in OTC drugs patient information leaflets, and the variety of content and format that these leaflets showed across brands and products, a new regulation has been created to standardize the information to the patient and present it in a way that would be easy to understand for everyone. These new regulations and guidelines have to be implemented within a period of two years for all registered products, and immediately for new registration, variation and change of marketing condition cases. Specific points: the information must be presented, both on the leaflet and the packaging labeling texts, in a question-and-answer format. Only information relevant to the patient should be included, in layman’s terms. WHAT DOES (comercial name) CONTAIN? Quantity of API, per dosage unit or percentual. Qualitative list of excipients. WHAT IS (comercial name) USED FOR? Symptoms and uses. WHO CAN’T USE THIS DRUG PRODUCT? Include allergies, contraindications and other situations in which use of the product could be adverse. WHAT PRECAUTIONS SHOUD I TAKE BEFORE USING THIS DRUG PRODUCT? Include warnings and precautions, relevant current and past medical conditions. Include: if you are taking other medication, you are pregnant or breast-feeding, ask your doctor before using this product. WHAT PRECAUTIONS SHOULD I TAKE WHILE USING THIS DRUG PRODUCT? Include adverse reactions and interactions. Indicate visit to the doctor in the case symptoms get worse or not revert after certain time. WHAT SHOUD I DO IN CASE OF OVERDOSE, OR IF I TOOK MORE OF THE PRODUCT THAN NECESSARY? Call and intoxication center, or go to the closest medical care center. Include telephone numbers. DO YOU HAVE ANY QUESTIONS? Include “ANMAT Answers” number, and company customer care telephone number.